There are different styles of Basarwa dance. About four (yes, they are that many!) of these are considered to be the best among the Botswana dance styles. To enjoy a complete course of these you must attend the Kuru Dance festival that takes place every 2 years. Or, you can attend the Western Kgalagadi Conservation Corridor (WKCC) cultural festival that takes every year in the Kgalagadi and Gantsi Districts. Basarwa have been and are still hunter-gatherers. They perform the hunting and gathering dance to mark both the preparation of the coming hunting or gathering expedition, and celebrating a kill after a successful hunting. Hunting Dance can be performed to mark a young boy's successful first kill of especially an antelope. He is secluded and later initiated by making scars on his arms; then eland fat is rubbed on the scars. Gathering Dance is performed in the evenings, mainly by women and young people. The Healing Dance deals with real sickness. It is similar to njangura dance performed by the Hambukushu. The dance is performed in the presence of a Shaman - a traditional healer or doctor. The location which will be large enough to accommodate dancers, singers and children will also have a fire which plays a central part to the healing process. The healing ritual starts in early evening going on well into the night. Singing starts with all songs named after birds and animals. The songs continue and sniffing of herbs helps to induce a trance. At the height of the trance the Shaman starts to sweat, breathe deep while crying and screaming. He connects with the departed then starts to approach the patient. He diagnoses the sickness and transmits healing through touching the patient. The patience touches back allowing the sickness to be transferred into the Shaman. Successful transfer of the sickness is shown by shivering, sweating, sweating and bleeding through the nose. The Shaman then casts the disease into the fire. This signals the healing and removal of the sickness. The entire group disperses at dawn when healing has been accomplished. The wedding ceremony dance is meant to make it known that a marriage proposal has been successful. The dance is performed after the man spent a night with the girl at the mother's compound. The bridegroom proves himself as a man and leader by going hunting. There is singing with women performing the dance by dragging their feet on sand. Eland fat is given to the bride's parent to anoint the bride; this is meant for the pair to have a prosperous life. 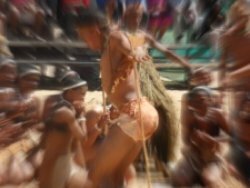 Ngwale or puberty dance is performed for initiation of a girl into adulthood. The performance takes place immediately the girl has her first menstruation at 12 or 14 years. It starts with the girl being isolated into a menstrual hut thereby secluding her from the rest of the community. The isolation is meant to have the elders give her instructions about her new status. She learns from old women about her role in the community, and specifically about her relationship with men. During the period, the girl is painted on the face. Meanwhile there is a lot of singing of eland songs by other women accompanied by dancing.